Maddow: Prepare For The Worst Case Scenario [VIDEO] - Joe.My.God. “There is no reason for any of those [Trump campaign connections to Russia]. Unless you were willing to believe the worst. And who wants to believe the worst? You don’t want to think too hard about the worst-case scenario. If the worst case is true. For everything that we’ve been through as a country, for every kind of trial and challenge and intrigue and embarrassment and scandal that we have been through as a nation, we haven’t ever had to reckon with the possibility that somebody has ascended to the presidency of the United States to serve the interests of another country rather than our own. “This is a reason why there’s a big national freakout over what the president just did in public. 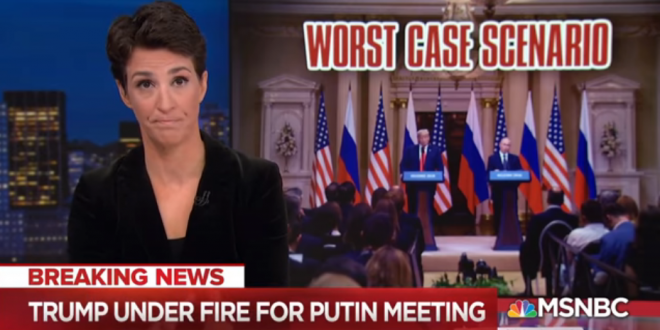 Whatever happened in the long private meeting he insisted on taking with Vladimir Putin today with no other American officials present, whatever happened there, what happened in public thereafter has really shaken the country today.” – Rachel Maddow, speaking on last night’s show.